On September 22, 2016, about 1820 Atlantic standard time (AST), a Learjet 25D, Venezuelan registration YV1738, was substantially damaged during a runway excursion while landing at Fernando Luis Ribas Dominicci Airport (TJIG), San Juan, Puerto Rico. The foreign-certificated pilot, co-pilot, and one passenger were not injured. The airplane was operated by WMG Techno-Logistic, C.A. under the provisions of 14 Code of Federal Regulations Part 91 as a business flight. Day, visual meteorological conditions prevailed at the time, and an instrument flight rules flight plan was filed. The flight originated from Punta Cana, Dominican Republic (MDPC) about 1750 AST. 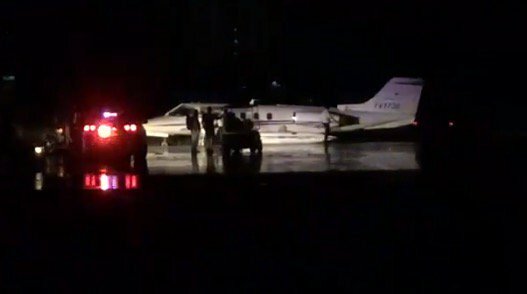 The pilot reported that the runway appeared to be wet as they were cleared to land. There was light rain on the windshield, and the rain intensified as they approached the runway. After a smooth landing on runway 9, as the airplane decelerated through 80 to 90 knots, the airplane began to hydroplane, and departed the runway surface to the left, into the grass. As the airplane crossed the intersecting taxiway, the left main landing gear collapsed, the airplane completed a 180-degree turn, and came to rest in the grass. The crew and passenger egressed the airplane and were met by first responders. The pilot later reported that there were no mechanical anomalies or malfunctions that would have prevented normal operation of the airplane. An inspector with the Federal Aviation Administration responded to the accident site and examined the wreckage. The left main landing gear actuator support beam was structurally damaged. The left wing tip fuel tank was scraped on the lower side. Rudder control continuity was confirmed. Runway 9 was 5,539 feet long and 100 feet wide. The runway surface was noted as "asphalt, in good condition." The runway was not grooved. FAA inspectors observed tire skid marks from all three landing gear on the runway, leading to the resting position of the wreckage. The skid marks were white in color. A subsequent examination of the main landing gear tires revealed that three of the four tires were worn to the point where no measurable tread remained. The number 4 (right, outboard) main tire measured 1.17mm tread remaining. The main landing gear tires installed at the time of the accident were approved by the airplane manufacturer. The Goodyear aircraft tire maintenance manual stated, regarding treadwear, "Inspect treads visually and check remaining tread. Tires should be removed when tread has worn to the base of any groove at any spot, or up to 1/8 of the tire circumference." The weather at TIG at 1820 included wind from 350 degrees at 8 knots, 2 statute miles visibility in thunderstorms, overcast ceiling at 2,000 feet, and altimeter 29.94 inches of mercury. A U.S. Customs agent reported that there was heavy rain at the time of the accident. The passenger on the airplane reported that there was 2 to 4 inches of water on the taxiway and runway and it was "raining profusely." Registered Owner: WMG Techno-Logistic C.A.